Oscillating on a swing, I gazed in oblivion at the myriad shades of blue that seemed more like a canvas of an artist. It drizzled intermittently, the breeze blew cold, the sun was about to retire, a lonely stork caught its second fish and I sat conjuring images of a surreal land. It was only when my coffee came that I realized that it wasn’t surreal but reality. 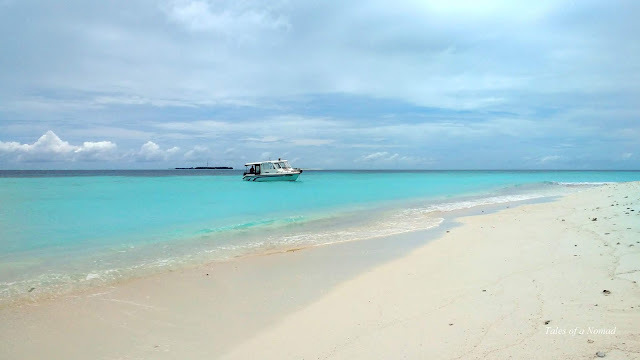 I was at one end of the endless stretch of beaches on Maafushi island in Maldives. 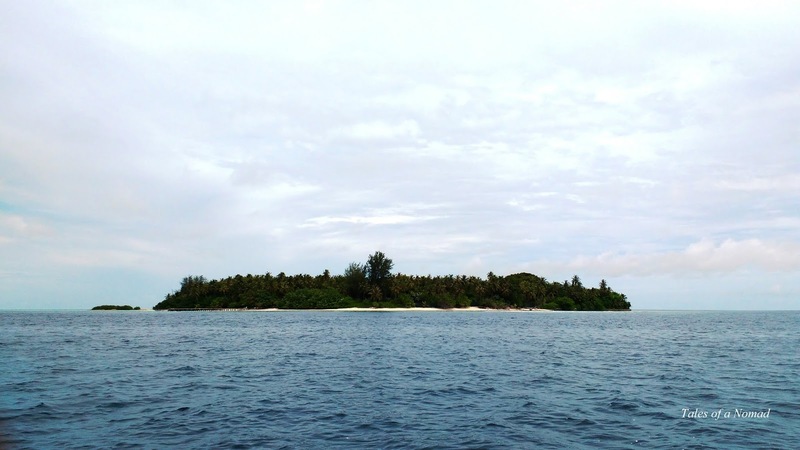 Located in Kaafu atoll, Maafushi is 27 kms away from Male and can be reached by a ferry or a speed ferry (speed boat). While the ferry takes an hour and a half, the speed ferry reaches in 45 minutes from Male to Maafushi. After the government regulation in 2010 allowing guest houses and hotels to be opened in Maafushi, the island has seen a drastic change as it has been a major boost to the economy which otherwise survived only on fishing. With a population of approximately 2700, the island is almost self-contained with a school, medical care, mosque and all basic necessities for its residents. 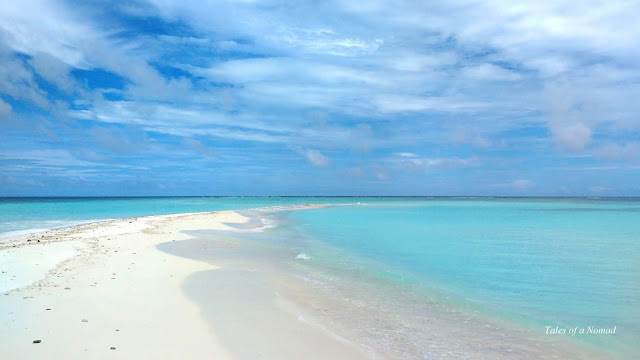 Maafushi is one of the popular budget options in Maldives and offers a host of guest houses, cafes, restaurants apart from various water activities for travellers. If you would like to visit Maldives on a budget, then Maafushi is the place to go to. The view outside Velana international airport was a stunner as the dramatic skies matched up to the azure waters. While numerous speed boats from various luxury resorts picked up their guests, I waited for my speed ferry to Maafushi which was booked through iCom tours. At sharp 6, the speed ferry left and had a brief stopover at Male. Left Male by 7 and we were cruising over the buoyant waters towards Maafushi. It had got dark by then and hardly had a clue of the surroundings. The dim lights of island resorts in the distance were all that I see. In less than an hour we reached Maafushi, where a person from the guesthouse was there to pick me up. A ten minute walk and we were at Dream Lagoon, where I was to stay for the next 3 days. Rashid, the manager was a friendly guy who briefed about the property, the activities available and other details. At 9PM I stepped out for dinner, anticipating if the restaurants would be open. Surprisingly the streets were lit, people were strolling around and restaurants were open. Despite being a tiny island which had recently opened up to tourism, they have coped well to the changes. After some Kothu Rushi, Narsi Goreng and a non alcoholic beer, I was back in my room. The complimentary breakfast at Dream Lagoon was pretty simple but good. The day began with a stroll through the sandy roads of Maafushi. There are two main roads running parallel to the beaches and numerous lanes cutting across and connecting these two main roads. While most of the houses are on inner lanes, the main road running along the jetty is lined with restaurants, souvenir shops and shops offering activities such as snorkeling, scuba diving and much more. The island has public beaches, water sport beach and bikini beach. Both water sports beach and bikini beach are located on the northern end of the island and is the preferred choice for tourists. While beach wears are not permitted across the island, the only place where one can wear them are at bikini beach. As I languorously strolled through the alleys of Maafushi, I noticed that the island has a unique public seating in the form of an iron frame with plastic/ coir threads, which definitely is creative, cheap and long lasting. They were spotted everywhere- by the beaches, under the trees, along the narrow lanes. The locals are friendly and they are always glad to help and guide you. Surprisingly, I noticed that almost all the offices and shops had female staff. They spoke pretty well (some with even a western accent) and many of them rode motorbikes. Despite being a small island where the entire population followed Islam, Maafushi is a prime example of women empowerment. Men mostly work on tourism related activities, in restaurants or go fishing. 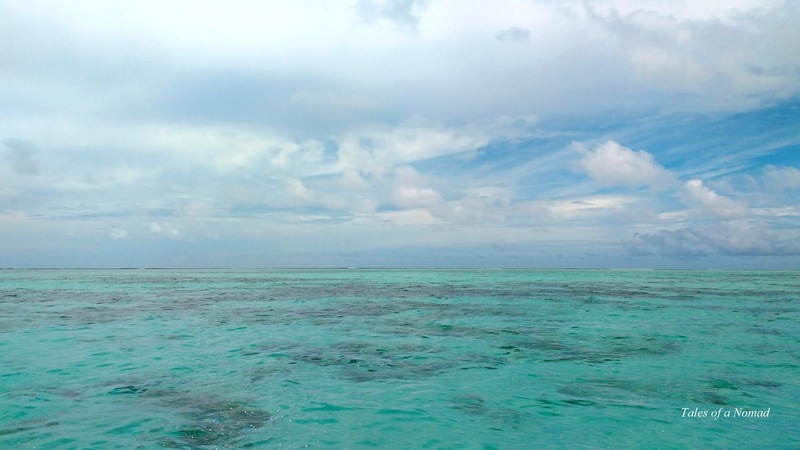 It either drizzled or was sunny throughout the day and I window shopped through the northern stretch of Maafushi. All the action and visitors are confined to this part of the island making it a popular place among travellers. Western travellers were even seen snorkeling off the bikini beach which is lined with coconut trees. Across the tall trees, multiple shades of blue formed an enchanting frame, one that would make you gaze for long with sea breeze brushing incessantly. 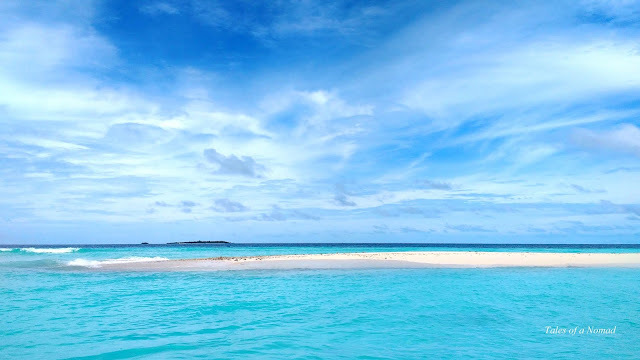 While in Maafushi, the major activities to do includes half day trips (snorkelling at a couple of points with turtle/ nurse sharks, lunch at a sand bank, dolphin watching, nemo pint etc. ), sunset fishing, visit to a local island, visit to an island resort, scuba diving and water sports (jet skiing, banana ride etc.). I headed to iCom tours to book the activities. Though they did have half day and full day tours, it seemed a bit ambiguous because they needed a minimum number of people for any activity or else it would be cancelled. I walked around and most hotels had these excursions on offer and when I checked at White Shell hotel, they informed that they had the required number of people for sunset fishing that day. Without any hesitation I went ahead with the booking ($25 per person). It is recommended to check these activities at any of the hotels as they would most likely have the required booking from the guests staying there. Sunrise beach resort served delicious tuna curry, prawns and rice for lunch and I also booked a half day excursion ($25 per person) for the next day. Again, they already had guests who had earlier booked the activity hence had the minimum number of people required. 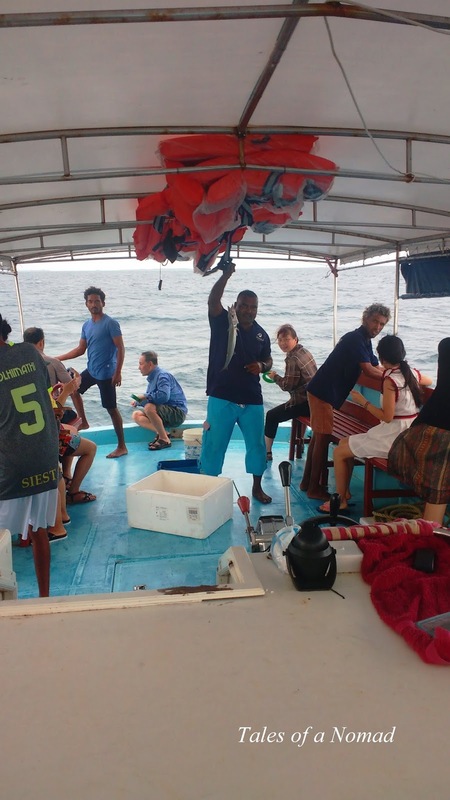 While at most places I noticed that they had only 4 points mentioned in the half day tour, Sunrise beach resort had five points in their tour which included snorkeling at Maavilath, Turtle reef, Biyadhoo reef, lunch at sand bank and dolphin watching. Another advantage for travellers is that most shops and restaurants accept both U.S. dollars and Maldivian Rufiya. The sun was at its scorching best in the noon and I headed back to the room shortly after lunch. The sunset fishing was scheduled to leave at 5 PM and along with a large contingent of tourists from Japan and Thailand, I boarded the motor boat. The cloudy skies didn’t reveal much of the sunset as we motored our way through the azure waters. Initially it was cloudy, windy, sighted a distant rain and the waters were rough. We headed deep into the blue sea and anchored after a 45 minute ride. It was time to fish and out came the cords and hooks. While some like me waited patiently for ever, a few were lucky to catch some colourful fishes. One tourist even caught an octopus, which was later released back into the waters. The first time experience of fishing definitely taught the importance of patience as I did hook two fishes after a long wait. An hour and a half passed as many fishes got caught, the sun set, it briefly rained and we returned to Maafushi. The package also included dinner and supposedly the same fishes that are caught are served. I found that a bit hard to believe. The third day began early as I set out after breakfast to Sunrise beach resort for the half day excursion. Ali, the instructor was a jovial fellow who led us first to Maafushi Dives to pick up the equipments and then to the speed boat. Myriad shades of blue spread out before us, and the boat sped towards Maavilath, the nearest snorkeling point from Maafushi. The cloudy weather was apt for snorkelling. The water was shallow and Ali helped us with the basics of snorkelling. With the snorkelling equipments and fins, we left for the deeper sections of the reef. It was blue all around for a while until corals in various shapes and colourful fishes showed up. The salty water made sure that I popped up every time it went inside my pipe. However, that wasn’t a deterrent as I went farther into the water world, only to be surrounded by more fishes and corals. After more than half an hour of mesmerising experience, we headed back to the boat only to be sped away again through more blue waters to Turtle reef. Turtle reef as the name suggests is known for turtles. As we jumped into the waters Ali mentioned not to go near the turtles and touch them as they would recede and get away. The water was prussian blue, had more colourful fishes, more corals, more depth and amidst all that we spotted a lone beautiful turtle. While it stayed a bit away from us initially and went down to the sea bed, Ali went near it and not sure what magic he did, the colourful turtle came up to the surface with him, took in some air, bobbed around for a while and then went down again. That was undoubtedly the most gratifying moment of my visit to Maafushi. We snorkelled for a while more and then got back on the boat to sight some dolphins. Even before Ali could say that we had reached the location, the boat was surrounded by more than 50-60 dolphins cruising their way through the waters, flipping in the air and coming up to the surface for a breathe. Though I had spotted dolphins earlier, sighting dolphins here was a breathtaking experience. Both the boat and the dolphins chased each other for a while before we headed to a sand bank for lunch. 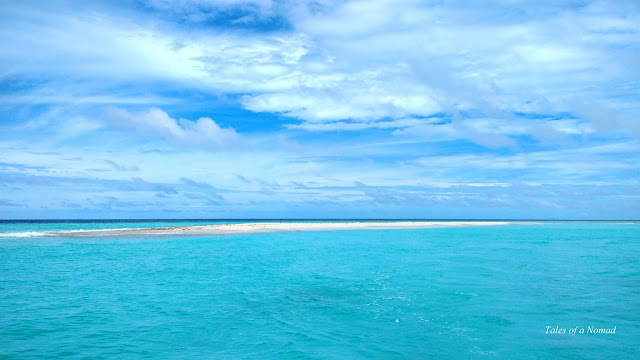 Sand banks are narrow stretches of land surrounded by blue waters and dead corals. It’s an ideal place for a photography session. A thin white strip of land surrounded by turquoise blue waters definitely makes a picturesque travel postcard frame. A quick lunch and photo session later, we were on the way to our last spot. Biyadhoo reef with its abundant marine life is one of the popular reefs to snorkel near Maafushi and when we reached, there were numerous other snorkellers already enjoying the gorgeous views beneath the blue waters. Ali cautioned that though this is probably one of the best reefs to spot a variety of fishes, their scales are sharp and could injure us. He added that we could feed the fishes here, but make sure not to go close to them and feed as they could bite the fingers along with the food. As we were about to jump, spotted another turtle taking in some fresh air on the surface. A school of fishes zoomed past me as I jumped into the water, most of them unicorn fishes. There were large school of fishes that went in different directions and each time Ali had crumbs of bread in his hand, he got swarmed by more fishes. The corals are gorgeous, large and in various shapes here. We were also lucky to spot both Nemo and Dory together at this reef. Biyadhoo reef was the best of the three places that I snorkelled with its huge collection of colourful fishes and corals. Half an hour later, the boat sped away taking us back to Maafushi. It was late in the afternoon when we reached back and a quick shower later I had some delicious sandwiches and buns from Suzy’s bakes. A stroll through the road running parallel to the main road revealed that it was pretty much deserted and the beach had seaweed washed ashore. However, a rainbow showed up and that more than brightened up the otherwise dull side of Maafushi. The bikini beach was where my walk ended and I enjoyed the sunset with a cup of coffee as it drizzled sporadically. The lemon fish thai style for dinner at Stingray beach inn was mediocre. However, the day had been an eventful one and I still visualised fishes swimming next to me every time I closed my eyes. Day four was set aside for a visit to the local island (Fulidhoo) and to Floating bar. Floating bar is a boat that is moored 500 metres away from the main land and serves liquor. Liquor is banned across the country and floating bar is the only place where you can have a swig in Maafushi. Both the visits were squashed as it drizzled incessantly through the day. Instead, I strolled through the alleys of Maafushi and ended at Kalaama restaurant (Velana hotel) for an early lunch. 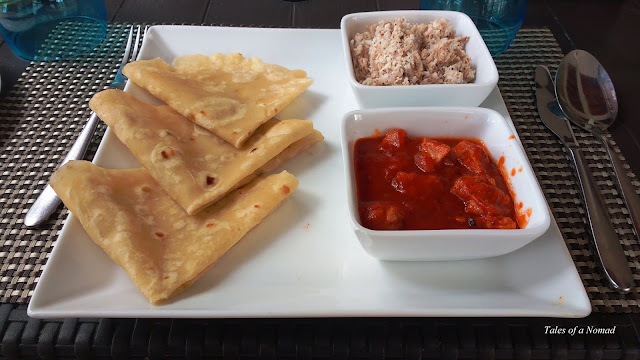 I delved into Roshi Mashuni combo, a delicious local dish. Roshi is similar to a chappathi and Mashuni is chutney made of coconut, onions and fish scrapes. The drizzle continued as I left the restaurant and walked to the other end of the island where the local prison is located. Back at the bikini beach, I sat on a large swing facing the sea, listened to the clattering of raindrops on the overhead cover, gazed at the gorgeous blue waters and sipped some coffee. I sat there for long, oblivious to the surroundings gazing at nature at its best. There was a melancholic charm to the whole setting and it was my last evening in the surreal island of Maafushi. Maafushi may not have a lot of things to do apart from snorkelling and half day tours. However, the charm of enjoying nature and strolling through this idyllic island is sure to leave you gasping for more. If you are looking to visit Maldives on a budget, Maafushi is the place. There are ferry services from Male to Maafushi. The ferry takes about 1.5 hours and costs $3 per person. Alternately, you can take a speed ferry by iCom tours which reaches in 45 minutes. The charges are $25 per person and the frequency of the ferry is higher. There are also speed ferries directly from the airport to Maafushi. Being a Muslim country, alcohol is prohibited across the island. 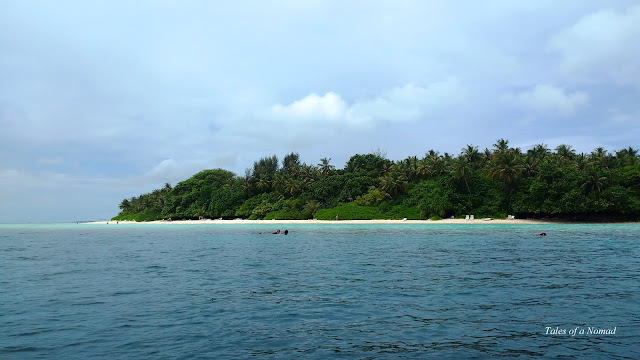 Maafushi is a conservative island which has recently opened itself to tourism. Please request before taking pictures of local residents. Beach wear is allowed only on Bikini beach and not anywhere else across the island. Most of the offices and shops remain closed on Fridays. The ferry services are also limited on Fridays. Most shops and restaurants accept both Maldivian Rufiya and U.S. Dollars. There are regular flights from Bengaluru, Kochi, Thiruvananthapuram, Mumbai etc. to Velana international airport, Hulhule island, Maldives. There are ferry and speed ferry services to Maafushi. There is no public transportation within the island. There are numerous cafés and restaurants across the island which serves Maldivian, Asian, Indian and Continental cuisines. The island has 55-60 guest houses and hotels which offer budget and mid range options. I stayed at Dream Lagoon guesthouse. Looks like one contended trip. I can imagine the dolphin activity. Awesome. Yeah, loved the idyllic island and the under water world. simply gorgeous..How much one should expect to spend per day/person? Glad you liked it. An approximate expense per day would be anywhere between 40-50$ per person. This would include your stay, food and taxes. Activities would be additional. The water looks painted. What pretty colors and dreamy shades of blue and green! Yeah, myriad shades of blue and green makes the island gorgeous. I too loved that seating.